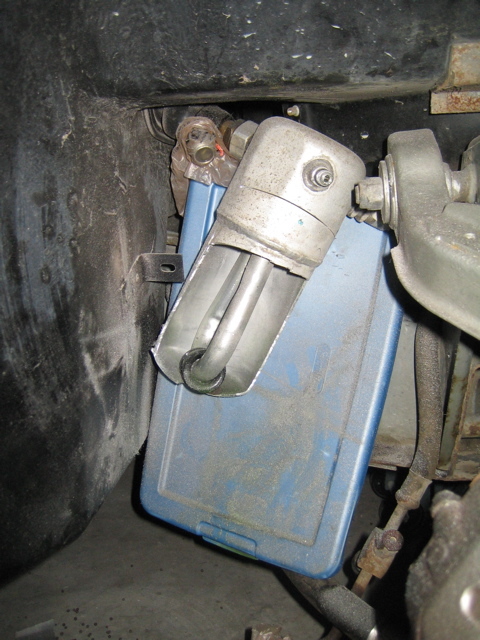 The A/C accumulator (also know as the dryer) removes the moisture, oils, and liquids from the AC system after it leaves the evaporator before returning to the compressor, sending back only the coolant as a vapor. 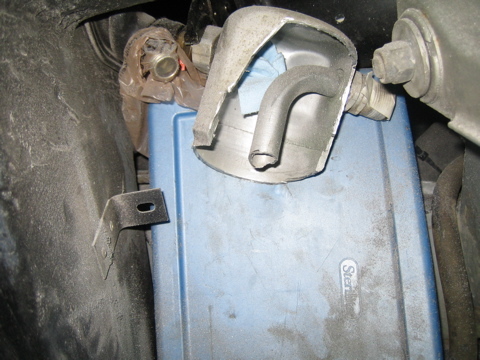 Liquid coolant will have a chance to return to vapor form, and any oils that escaped from the compressor will be captured. Replacement of this part should be done when any major A/C work is being done to the system, for example when the system has been evacuated and opened, especially when the system is 25+ years old. In my case I am fixing a leak in the low pressure switch and compressor, and wanted to replace it while working on the system. 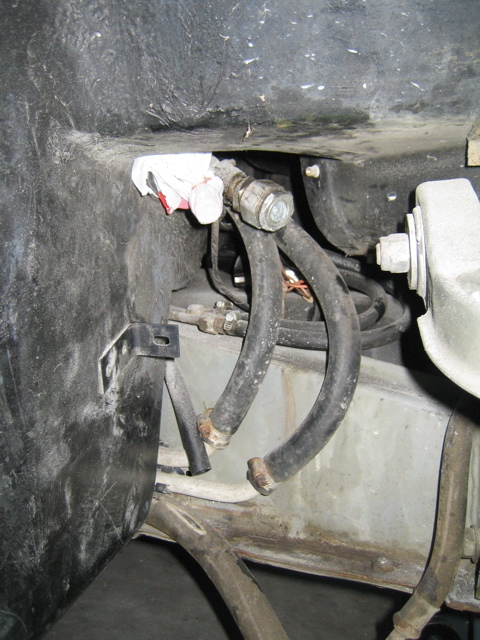 A major problem however is when removing the A/C accumulator, the brass evaporator pipe has to be disconnected. This is a very delicate piece that is generally broken when attempting to remove the accumulator. Breaking this pipe means replacing the evaporator, which results in tearing apart your dash and interior to get at it. A long and unwelcome job. Like everyone who thinks they can do it without breaking anything, I jumped in and thought "Eh, I'll get it done right, no problem" however when I started to crank on the evaporator pipe, my fears worsened as it was not budging and flexing the pipe too much for my liking. Thus began my 'unorthodox' attempt to remove the accumulator. This how-to assumes that you have removed the high pressure line from the evaporator, the return line from the accumulator, and the low pressure switch from the accumulator, leaving only the evaporator <-> accumulator connection in place (which we are now going to remove). It also assumes your passenger tire is removed and car is elevated for easier access. Tip: I took cut up plastic bags and wrapped the open hoses from the A/C system and twist-tied them to protect them from any dust/debris that will be flying around. Tip: I also began spraying down the nut with PB blaster 48 hours in advance, twice a day. This allowed it to soak and hopefully make removal of the line easier. Step 2: Cut off pipe as high up as possible and remove the plastic innard. IMPORTANT - now take a shop rag and reach up into the open evaporator. 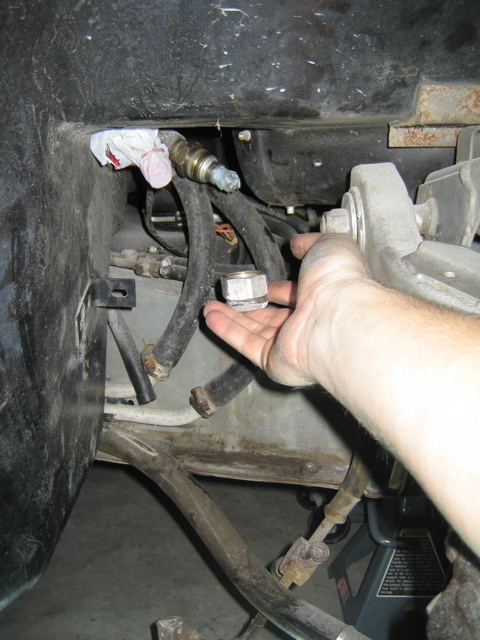 Plug the evaporator hole as good as possible to keep any dust/debris from entering the open A/C system. Disclaimer: This is my method of removing the accumulator. I take no responsibility for any damage that may result from following this walkthrough. Be aware, any work done is at your own risk.